Van Halen is primarily an American hard rock band with roots in the Netherlands (the original birthplace of the Van Halen brothers, Alex and Eddie Van Halen, being Nijmegan, Netherlands), heavy metal guitar rock riffs and hooks, with coincident Glam Rock music status, “spotlight on” the flamboyance and over-the-top hypersexuality of lead singer David Lee Roth. The main focal point of the band’s overwhelming popularity has been the guitar virtuosity of Eddie Van Halen, mixed with the onstage antics and attractiveness of David Lee Roth. The 1978 debut album of the band, entitled Van Halen, is widely regarded as one of the music albums that changed the course of rock music history, leading the way for the music genre of heavy metal to evolve in upcoming decades. (For this and more band history, see Wikipedia.) The band members at that time, at the group’s inception were: Eddie Van Halen (lead guitarist), David Lee Roth (lead vocals), Alex Van Halen (drums), and Michael Anthony (bassist). The RIAA (Recording Industry Association of America), has listed Van Halen as the 19th best-selling band/artist in United States history, with sales of over 56 million albums in the U.S. and over 86 million albums worldwide. Also, Van Halen is only one of five rock groups that have had two albums sell more than 10 million albums each. 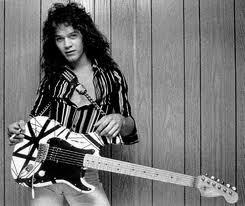 Eddie Van Halen and Alex Van Halen are the sons of musician Jan Van Halen, who arranged for them to have music lessons. The Van Halen brothers started playing music together in the 1960s, with interestingly, Eddie playing piano and drums and Alex playing guitar! One day when Eddie found out that Alex had been playing his drums, Eddie decided, out of frustration, to start playing Alex’s guitar: youthful beginnings to the foundation of astounding guitar musicianship to come in the form of Eddie Van Halen’s heavy metal style, most definitely an innovator for all time. In 1972,in California, the Van Halen brothers formed a group named “Genesis” while renting a sound system from David Lee Roth in the process. In order to save money on renting the sound system, the brothers decided to offer Lee Roth lead vocals in a bartering deal, to which then led to David Lee Roth becoming a permanent part of the band. By 1974, the rock group decided to replace then bassist Mark Stone with Michael Anthony, who was then performing in a band called “Snake.” The band later changed their name to “Mammouth” after finding out that there was already another band with the name “Genesis.” The name “Van Halen” for the band was introduced by David Lee Roth, who thought the name suggested power. The band Van Halen started playing at parties and other local gigs around Hollywood and Pasadena, California, while also passing out flyers to their gigs to local high schools in the Hollywood, California area. This garnered the band a huge following and from that, Van Halen started to establish themselves as headliners at mainstream L.A. nightclubs of the 1970s, including the famous Whisky a GoGo. Van Halen recorded their first demo tape at Cherokee Studios (now defunct), also the recording studio for Steely Dan at the time. Van Halen’s career began to intensify when the famous rock music impresario Rodney Bingenheimer checked out the band at the L.A. club Gazzari in the summer of 1976, and being quite impressed took Gene Simmons of KISS to see them. Gene Simmons then produced a demo tape in New York, presented them to his managers, but being told “no chance whatsoever”, he discontinued further involvement with the fledgling group. (See Wikipedia) Van Halen’s pursuit of the “Rock N Roll dream” began to heat up even more when two Warner Brothers’ record executives (Mo Ostin and Ted Templeman) saw Van Halen perform at the Starwood in Hollywood; the execs were so dazzled that they offered the band an extensive recording contract within a week. Upon its’ release, the debut album Van Halen reached number 19 on the Billboard pop music charts, one of rock’s most commercially successful inaugurations. The album contained these classic songs by Van Halen, “Runnin’ With the Devil” and “Eruption”-showcasing Eddie Van Halen’s guitar mastery. The band returned to the studio in 1978 to record Van Halen II, which resulted in the band’s first hit single “Dance the Night Away.” Over the next album, Van Halen was prolific with album releases and touring: Their Women and Children (1980), Fair Warning (1981), Diver Down (1982), and then the pinnacle of their career, Van Halen’s 1984 (1984) , which showcased such monster hits as “Panama”, “Jump”, “I’ll Wait”, and “Hot for Teacher.” The album generated three music videos on MTV and debuted at number 2 on the Billboard chart’s, behind Michael Jackson‘s Thriller. The album, although a huge profit-maker, was also a breaking-point for the band! The ginormous egos of the band’s two massive stars, Eddie Van Halen, and David Lee Roth, had had several explosive tangles in the past, but now their differences were at fast forward fury. Lee Roth reportedly was upset about Eddie playing outside the band without the other members’ permission and Eddie’s drug abuse (alleged) that prevented certain viable practice sessions. Eddie was sick of Roth’s flamboyant stage behavior and at times ridiculous antics, and both differed in their view of the band’s image/direction for the future. During this time in 1985, Eddie Van Halen, as the group’s leader, began to look around for lead singers to replace David Lee Roth. He invited Patti Smyth of Scandal to replace Lee Roth but she refused. Eddie was then introduced to another singer, Sammy Hagar, who he knew from a mutual auto mechanic. Drumroll please as we are now entering the crucial phase of the endless debate amongst Van Halen fans of which singer is better: David Lee Roth or Sammy Hagar?HA Visit any Youtube page of Van Halen music videos and fans are still debating this to this day. Sammy Hagar had had a hit with Warner records with “I Can’t Drive 55”, had an album with Montrose, and agreed to join the band, also adding his skills as rhythm guitarist to deepen the sound. The 1986 album 5150 (named after the address for Eddie Van Halen’s studio) was a success, with keyboard-driven singles such as “Why Can’t This Be Love”, “Dreams”, and “Love Walks In.” A new Van Halen logo was added to the album art, symbolizing the band changes. The band had many more triumphant studio albums during the reign of Sammy Hagar, which lasted until 1996. It was in the Hagar era that Van Halen was nominated for two Grammy awards, winning an award for Best Hard Rock Performance in 1992. Success often breeds discontent amongst stars, and because of disputes between Hagar and Eddie Van Halen, Hagar’s career as lead singer ended in 1996. Hagar claimed he was fired; Van Halen said that he quit. Overall, it was a technicality of sorts, because the Van Halen band members had been secretly recording tracks with David Lee Roth again, which led Hagar to quit/be fired. There is further detailed and extensive history on this ground-breaking band. (See Wikipedia for more information and citations). On March 12, 2007, Van Halen was inducted into the Rock and Roll Hall of Fame and were introduced by Velvet Revolver. Michael Anthony and Sammy Hagar were the only members (both ex-members at that time) in attendance. 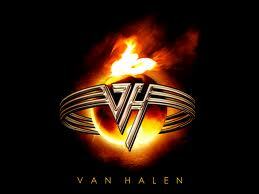 In 2012, Van Halen released A Different Kind of Truth -their first album in 14 years (since 1998’s Van Halen III). It is the first Van Halen album to feature Eddie Van Halen’s son, Wolfgang on bass ( and still in high school!) in place of Michael Anthony. It is also the first album to feature David Lee Roth’s vocals in over 15 years. Van Halen announced a tour to support the album, from 2012 to 2013. The Van Halen News Desk reports that Guitar World named A Different Kind of Truth as the #1 album of the year (for 2012) and Rolling Stone named “Stay Frosty” in their “50 best songs” (of 2012). Keep up with the mighty Van Halen at http://www.vhnd.com!